1 - 99 $1.72 ea. 100 - 249 $1.69 ea. 250 - 499 $1.64 ea. 500 - 999 $1.60 ea. 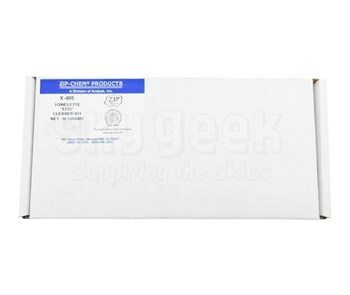 Zip-Chem X-405 is a water based neutral pH cleaner specifically designed for use on aircraft windows, plastic transparencies and "EFIS" Electronic Flight Instrument Systems. X-405 is available in Ready-for-use packaging and is very effective in wipe-on wipe-off applications. X-405 contains a select group of surfactants designed to solubilize and lift a wide variety of contaminants without the use of abrasives or harsh solvents. Safe on Aluminum, Magnesium and all structural metal. Safe on all quality paints, primers and acrylic plastics.